SEQUESTERGATE: Chicago-style politics at its worst … now they are attacking the press. The Empire Strakes Back … Not only does the Barack Obama White House not like the Second Amendment, it would appear that they also have a disdain for the First Amendment and “Freedom of the Press”. A senior White House official threatened Bob Woodward in an email stating, “you will regret doing this”. The “this” that is being referred to is veteran journalist Bob Woodward’s not carrying the water for Barack Obama like the rest of the liberal, corrupt media complex when last week Woodward called out Obama for what he said was “moving the goal posts” on the sequester by requesting that revenue be part of a deal to avert it. Woodward had previously stated, “So when the president asks that a substitute for the sequester include not just spending cuts but also new revenue, he is moving the goal posts… [T]hat was not the deal he made.” How dare anyone go against the imperial president Obama and call him for what he is, a liar. As stated at the PJ Tatler, Woodward spoiled Obama’s plan to blame the entire sequester on Republicans, then allow the cuts to hit, and blame them again. So what does the Obama WH do, attack a member of the press and try and trivialize him. So much for “Freedom of the Press”. Woodward stated, “It makes me very uncomfortable to have the White House telling reporters, ‘You’re going to regret doing something that you believe in.” What must the rest of the MSM be thinking, who have never displayed a spine or journalistic integrity when reporting on President Obama? WOLF BLITZER, CNN: You’re used to this kind of stuff, but share with our viewers what’s going on between you and the White House. WOODWARD: It was said very clearly, you will regret doing this. BLITZER: Who sent that e-mail to you? WOODWARD: Well, I’m not going to say. BLITZER: Was it a senior person at the White House? Isn’t this something? When Bob Woodward was reporting on Watergate and bringing down the presidency of Republican Richard Nixon, he was a hero. Now that Woodward is using the same truth and principles he did during Watergate against Barack Obama, the LEFT are attacking him. It is so predictable and pathetic. How about a little consistency folks? In all reality, had the liberal, corrupt media complex done their job and actually investigated this president, his anti-Constitution, green-energy payoffs would have made the Watergate scandal pale in comparison to the actions during the Obama administration. In an interview with his own paper, The Washington Post, Woodward says he never called Sperling’s comment a threat. SM: Then why is Woodward talking about it? Hmm? 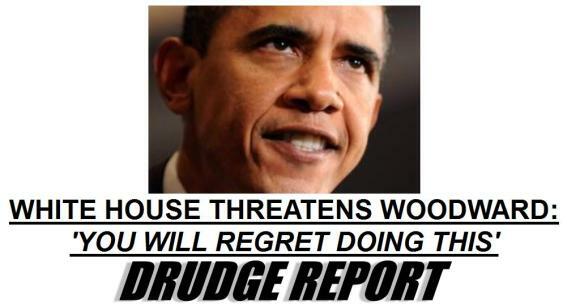 This WH has threatened many in the media, they are just too much of a bunch of cowards to come forward. Although some have.